How Do Americans Want to Die? 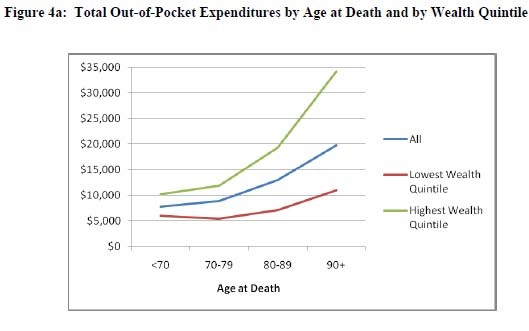 Dying in America is expensive. It's expensive for families experiencing death, whose out-of-pocket expenses in the last year of life run in the thousands, or tens of thousands, of dollars. It's even more expensive for taxpayers, who bear most of the Medicare cost in the last year of life. As Atul Gawande writes in a beautiful, painful, provocative New Yorker essay, the hardest question to ask -- How do you want to die? -- is also one of the most important questions in health care policy. For families, the decisions we make about our loved ones when hope is gone feels as far away from federal budgeting as you can get. But step back, and you see the relationship is intimate. Our long term budget crisis is mostly a Medicare crisis. And 25 percent of Medicare spending goes to the five percent of Medicare patients in the last year of life. The difficult thing about debating Medicare in public is that we're a victim of our own success. Half of Medicare's runaway costs in the next three decades comes from increased longevity, according to the CBO. Longer lives is a good thing. The other half comes from "medical inflation," which means we're spending more to access our impressive fleet of medical equipment and services. Every year, we're coming up with new machines and procedures that increase our health. Better medical technology is also a good thing. But these two good things have a side effect: they threaten to grow US debt beyond anything this country has ever experienced. Our medical system is excellent at trying to stave off death with eight-thousand-dollar-a-month chemotherapy, three-thousand-dollar-a-day intensive care, five-thousand-dollar-an-hour surgery. But, ultimately, death comes, and no one is good at knowing when to stop. "Knowing when to stop." It is an issue too wrought with emotion to analyze with a clutch of long-term spending charts and Medicare surveys (see: "death panels"). It is also too important to long-term spending and Medicare solvency to ignore. Gawande says he finds hope in hospice care. I don't know enough about the topic to corroborate or question his findings. You should read the full story. The big idea to remember is that "How do Americans want to die?" is a sad and inevitable question, not only for every family, but for the country, as well.